my creations are nature inspired, simple, and tasteful. charged with reiki and mindfully made. Macrame is a style of thread wrapping around gemstones. Gemstones has been used for century to aid healing in the body and give the wearer a greater sense of balance and well being. All of the gemstones I use have been infused with Reiki, and programmed for the healing of the wearer. I sell pre-made designs at craft shows and take custom orders. Want a certain stone? Contact me! 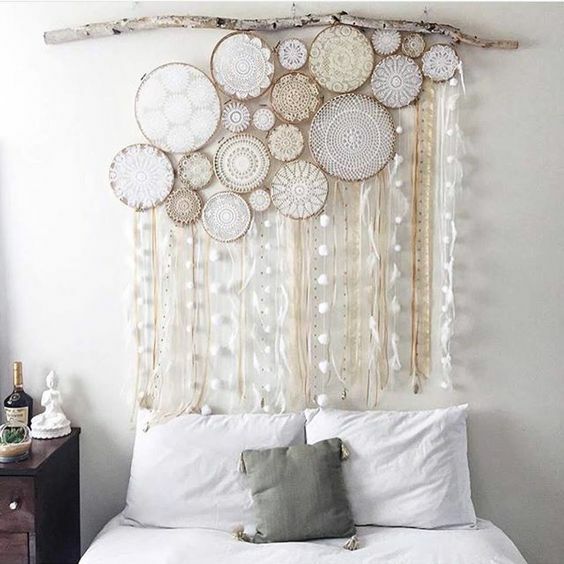 Dreamcatcher inspired wall art is one of my newer en devours. Created by custom order only to fit any space, any size. On a budget? We can work with that! Contact me! I work with modern style dream catchers and particularly enjoy creating pieces with lace and flowers. Created by custom order. Have a wedding or event? Nothing looks more beautiful than a room full of lace. Except maybe lace blowing in the wind outdoors! Contact me!